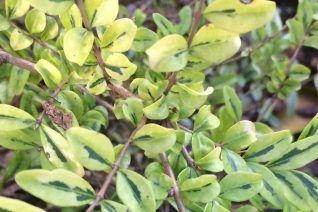 Dramatic yellow foliage with an interior of deep green on the small evenly spaced evergreen leaves of this low spreading shrub. To 3′ x 4′ and forming something of a mound. Spreads low at first- gains height with age. Rich soil with light summer water in full sun to part shade. Very drought tolerant when established. Lights up borders, is easily clipped- without mangling the small foliage. Flowers are tiny and cream colored often followed by translucent purple berries. Sometimes reverts to all green – just cut those reversions cleanly out. Very easy to grow plant for foundation plantings, tough sites, hedges. There is some confusion over the exact species…if you look it up half say L. nitida and half say L. pileata. I’m going to have to go with L. ??. Shrubby honeysuckle. British selection that is a golden dwarf form of L.n. ‘Baggesen’s Gold’. 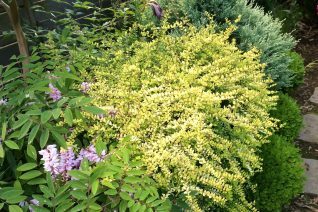 Low compact dense growing ever-gold shrub that is well scaled for small gardens. To 1′ tall and in a long time 1/1/2′ wide. Full sun to part shade in rich to average well drained soil. Leaf color is most vivid in full sun and hardiness to cold improves there too. We have never seen flowers on this cultivar of box leaf honeysuckle. Easy to grow. In very cold winters the foliage takes on maroon tints. Low hedges, massed as a ground cover. 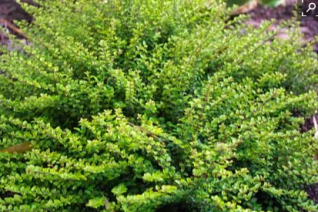 Useful fine textured golden evergreen shrub that brightens the landscape. This form of box leaf honeysuckle is popular as a sheared hedge but we think it makes a better focal point. The leaves can burn in the hottest locations and conversely turn a bit more green in the shade. Takes any amount of pruning. We have yet to notice flowers or berries on this cultivar. To 4′ x 4′ very quickly. Very drought tolerant when established. Cold hardy to 0ºF when established. May be pruned into any conceivable shape. The tiny leaves escape damage by shearing and the whole plant becomes immensely dense. Prune virtually any time of the year. Tiny yellow flowers are not very conspicuous but can transform into translucent purple berries if pollinated. Fast growing. 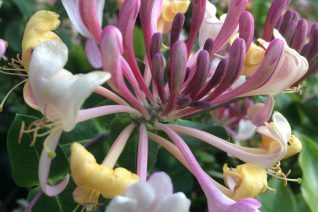 A hybrid between two european species has yielded one of the best climbing honeysuckles we can grow. Less prone to pests and disease this prolific blooming vine produces huge trusses of pink/yellow/cream highly fragrant flowers from late spring to autumn. A non-twining semi-evergreen vine that requires the support of something in which the canes can interweave and be supported. Often bare at the base- plan for this. To 12′ tall and as wide. Massive initial display of flowers in late spring and then sporadically until Sept. Full sun to light shade and regular summer water to increase vigor, spur re-bloom. The fragrance is not sweet and cloying rather a complex blend of cloves, cologne and petunia. It carries for quite a distance. A good sized specimen will perfume the entire block.